Josh Dun would readily admit that he listens to his own music. "I love these songs. I'm a fan of my own band," he said in a phone interview during a recent tour stop in Belgium. When faced with the task of writing a follow-up to their breakout album Vessels, Dun, drummer of Twenty One Pilots, said it can get complicated with so many competing forces at play. "When there are more hands in the pot—maybe it's more fans, or maybe radio's involved, or a label, or even just people in the industry who want to throw out opinions or suggestions—it'll trip you out a bit," Dun said. 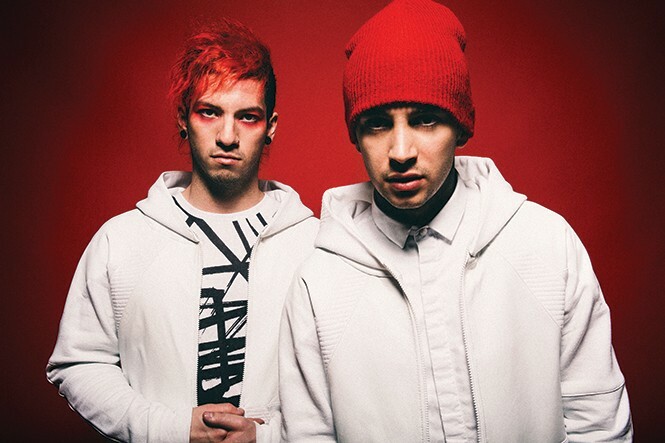 The duo's fear of suffering the fate of other sophomore slumps churned in their guts, he said, but singer Tyler Joseph and Dun simplified the process by considering those who will be listening to their music the most: themselves. "At the end of the day, Tyler and I sit down, and we're like, 'You know what? If things go the way that we want them to, what do we want to be playing for the next two years, 10 years, however long?'" he said. "Because we actually listen to our music, and I enjoy listening to our music. So it's like, 'What do we want to listen to?' And at the end of the day, that's what we end up writing." The Columbus, Ohio, schizoid pop duo is coming off a 2014 that many consider their breakout year—a delayed reaction, some might say, considering their last record dropped in January 2013 and what might have been their breakout year came and went without a hit single on the charts. But extensive touring—including at some big-name festivals like Lollapalooza and Bonnaroo—and positive word of mouth culminated in enough buzz to land their follow-up, Blurryface (Fueled By Ramen), at No. 1 on its debut week in May. The album, which has received positive nods from critics and fans, ventures beyond the keyboard-and-drums foundation of their first two full-lengths to explore everything from power pop to reggae. The ukulele-driven "We Don't Believe What's On TV" sounds like a Violent Femmes-esque hootenanny, while the synth-heavy "Hometown" finds Joseph using a baritone croon that brings Depeche Mode to mind. It's not a new direction; it's expounding on the lyrical shtick they had already refined by the time Vessels dropped, where the main topics of discussion are the all-too-relatable feelings of self-doubt and insecurity and how to overcome them. "Am I the only one I know/ Waging a war behind my face and above my throat?" Joseph laments on "Migraine," the third track on that record. This time around, they continue addressing those topics but project them onto the aforementioned pressure to release a second consecutive hit album. "I'm in constant confrontation with what I want and what is poppin' in the industry/ It seems to me that singles on the radio are currency," they confess on Blurryface's latest single, "Lane Boy." But Dun said not to read too much into that line as it pertains to the current state of music, since he actually listens to the top radio tracks for influence." That song in no way is to meant to bash the industry or the whole idea of singles," he said. "I've always been intrigued by [Billboard] Top 40. ... And I enjoy it, anyway. It's not a loss to incorporate some of that stuff." Navigating pop and other influences was tricky, he said. Places of inspiration for the new record ranged from European reggae to his parents—"Sometimes I think, 'Well, my mom would like this kind of song,' " he said. "The challenge is really making it us," he said. "Because the scary thing is taking a lot of different influences or things that you love and meshing it all together, but then it could turn into some crazy toxic sludge that doesn't make any sense. ... We really have to work to make it a Twenty One Pilots song and not this crazy thing. That's the challenge, but it's also the fun part." Another main character on Blurryface is the music itself; seven of the 14 tracks appear to address the music directly, starting with the first verse of the first (and title) track, where Joseph raps, "This is not rap, this is not hip hop/ Just another attempt to make the voices stop." But those insecurities and copious amounts of self-awareness are tough to spot onstage, despite the fact that Dun admits to having spurts of panic before stepping into the spotlight. "There are times when my tour manager will count down from 10 before when we walk on stage, when it's so bad ... every other second, I'm like, 'We're going to go on!' and the next second, I'm like, 'I can't do it.' I'm all stressed out." They don't appear nervous onstage. Joseph's mother has publicly condemned his tendency to climb things during performances, and Dun has been known to do a killer backflip off Joseph's piano, between and during performances of fan favorites like the piano-happy "Tear in My Heart," existential rant "Car Radio," and ode to self-control "Holding on to You." All songs, Dun said, he is happy to listen to for the foreseeable future.